Upon its release in 1972 Seville was the most expensive single piece of Pyrex opal ware available. Seville debuted on the consumer market in 1971 and was available in 1972. Listed in the “Gifts” section of the 1972 Pyrex catalog Seville retailed at $7.95. The 2 ½ quart Oval Casserole (045) came with a double candlewarmer. 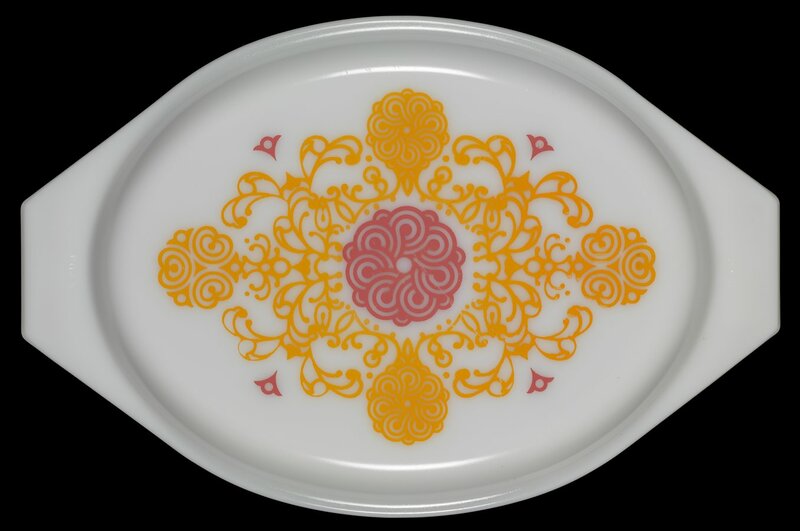 Seville has a tangerine colored dish with a white opalware lid printed with red and orange stylized floral flourishes. Seville was discontinued in mid-1972 and was the most expensive single Pyrex dishes available at the time, matched in price only by the three-piece casserole sets.